Learning from an expert is the best way to become a proficient pilot yourself. So learn from us! Our instructors are very experienced and are recognized by Transport Canada, which is vital for earning your certifications. We offer training courses for both paramotoring and paragliding. Even though you can learn how to fly with a motor without any previous experience we recommend starting with paragliding first. We see a natural progression from paragliding to powered paragliding because they are very similar with the exception of adding a motor, and thus more variables. Click here to learn more about paragliding courses we offer! Safety is our number one priority. Paramotoring gear design has come a long way in terms of keeping the pilot safe but the biggest factor when it comes to your safety is learning the proper skills to utilize the gear and perform the sport safely. The equipment can't do that for you, you have to do that for yourself. Our courses will save you time, the frustrations and finally tons of money in broken cages and props. We can't stress enough how important it is to learn everything properly. A skilled pilot is a safe pilot. Our instructors are certified by the Hang Gliding and Paragliding Association of Canada. The have their first aid certificated, and of course, they are active pilots. This has become more than just a hobby. You can find us doing just about anything ranging from flying cross country, to participating in competitions, attending meetups, constantly testing new gear, and fostering our local and national community. They know their stuff, and they'll pass this knowledge on to you. By now you already understand that paramotoring is form of paragliding. We fly using paragliding wings and small 2-stroke motors strapped to our backs allowing us to take off and stay in the air. What you may not know is that paramotors (called also PPG, powered parachutes or powered paragliders) are categorized in Canada as ultra-light aeroplanes. It's very important that you understand this as it means powered paragliding is treated more or less the same way as any other aircraft flying in Canadian airspace. This means that we have to comply with an entire set of requirements in order to fly legally. Not to mention that disobeying these restrictions could get you in trouble with Transport Canada and the law in general. In exchange, you will be granted privileges that are equal to those of any other pilot in Canada. Keep reading below to learn the steps required to fly legally in Canada. Be at least 16 years old (detailed requirements are outlined here) and of average fitness. Find a school approved by Transport Canada (search for "powered parachutes" there) in order for it to count towards you becoming legally certified to fly. Your instructor must carry ULTRA pilot rating with instructor privileges. Once you've decided to start your training, you'll pay your training fees. We'll do the paperwork required. You'll have to sign a waiver, fill out a CAT-4 medical form, and we'll make copies of your government issued documents confirming your citizenship, age and address (passport, birth certificate, driving license). We'll get you books, textbooks, DVD videos, a VNC map and unlock your access to our online ground school portal. There is a written exam called PSTAR (Pre-Solo Test of Air Regulations) that we conduct after you finish your ground schooling. It is required before you can get your SPP (Student Pilot Permit) and can start actual flying lessons. You will have to complete a minimum of 20 hours worth of theory lessons, wing ground handling training (between 40 to 120 hours) and 5 hours worth of airtime with a minimum of 30 flights under our instruction as Transport Canada certified instructors. The hours specified are minimums required by law. It takes some students longer but that's okay. The really important part is ensuring you are comfortable and capable of executing regular and emergency flying procedures so that you're safe at all times. Once this step is completed and we're happy with your progress and the results of your training you'll receive letter of recommendation from us. We'll also sign your log book which will allow you to move to step 2. Another exam you'll need to write is the ULTRA exam. This exam is conducted by Transport Canada. Our ground school covers the topics of this exam as well, and we also provide the textbooks you'll need to read up on. We have an online portal to teach lessons through videos and audio clips that are really helpful in learning and we provide a sectional VNC map to our students. We support you in many ways to make passing the test seem less daunting. When prepared to write the exam, you can make an appointment at your nearest Transport Canada Test Centre. The test has a 3 hour time limit, and to pass you'll need a grade of 60% or higher. Don't stress! The exam is simple and if you study, you'll pass with flying colours (no pun intended)! When you pass your ULTRA you can then apply for your pilot permit. You can do that the same day, right after your ULTRA exam when you are at the Test Centre. NOTE: it can take Transport Canada anywhere from a few weeks to couple of months to issue your Aviation Booklet and pilot permit. If you would like to start flying right away you'll need to ask for "temporary privileges" and that is an additional $40 fee. The TC officer will print you a 90-day temporary licence for you which will allow you to fly while waiting for your documents. We recommend you buy your equipment from us. There's no downside. We offer high end products from world class producers, but at a fair price. Best of all, you'll be able to train with an instructor who is extremely knowledgeable about your gear and will teach you every detail there is to know. At this point it's worth mentioning that we do provide equipment for training. You'll get trained on brand new, top of the line equipment. Not many schools do that. We believe in quality training. Start with a look at the products we offer or give us a call to learn more about why we're a trusted source for your gear. In Canada, paramotors - like every other aircraft - need to be registered with Transport Canada. If you purchase your paramotor from us, we will register it as a courtesy. In case you own one already, the steps required to register your paramotor are outlined here. You'll need liability insurance that covers the risks of public liability in an amount no less than $100,000. This usually costs around $10 per month. Paragliding and PPG are the simplest, least expensive, uncomplicated forms of flight around - but good training is essential if you want to truly enjoy this sport and avoid bad habits and costly mistakes. Darek runs a well organized and in depth course during which you will learn all the best practices good habits you need to make you a responsible pilot. If you have no idea what to expect but you spend hours watching Tucker Gott's videos, and you hope you can fly from your local park, this intro session is for you. This course is a comprehensive introduction to powered paragliding. This is a ground course only, so without taking flight, you will learn about the equipment, the preflight checks that take place before every flight, and lastly handling skills to understand how to do a proper controlled launch with the paraglider. We will go over proper wing inflation and takeoff, control during launch (touching on pitch, roll, yaw, and direction - all of which we'll explain), and lastly how to transition smoothly from running to flying on takeoff. This session will give you a good understanding of what this sport is about and what's required to do it safely. If you have no aviation experience this course is for you. Our full course is everything you'll need to start flying solo. It covers both ground school theory-based lessons and practical training. Our ground school is available through an online portal, which you'll gain access to for 9 months. In it we offer over 50 hours of ground school videos and MP3 audio training with over 600 practice exam questions. This online training gives you the flexibility to work around your other commitments. It's a perfect winter project and complements our in-person ground training. We provide access to the PSTAR course, which prepares you for the pre solo exam you'll need to take to get your student pilot permit. We also include the Canadian Radiotelephone Operator's Restricted Certificate (Aeronautical) course, which prepares you for the for the radio operators exam (it's optional but we strongly recommend you take that too). We also provide students with the textbooks needed for passing the ULTRA exam. Ground training is all about teaching you how to control your wing so your take offs and landings are smooth as well as safe. We use a hydraulic winch, perfect for training because it allows beginner pilots to get in the air easily. Short flights (without a motor) are perfect to fully absorb hands-on information from the three distinct parts of the flight - the take off, in flight, and landing. We start with 5 to 10 low flight to teach basic wing control during flight and proper landing technique. If you are a current ULTRA, PPL or REC pilot this course is for you. Since you're permitted to fly an aircraft with higher requirements than powered parachutes you don't have to do ground school or pass ULTRA exam. Your license covers PPG and you just need to learn how to operate them. You also need to be current (medical). Your previous experience will help with flight planning, weather, rules and procedures but as far as flying PPG goes, you're as much of a newbie as the rest of our students. Your experience and pilot wisdom will help you for sure (aerodynamics are the same everywhere). Decisions making process is one of the hardest things to learn and one of the most valued skills at the same time. Since you have it nailed already that gives you a massive advantage. We'll focus on teaching you how to operate a powered paraglider, and we'll go over differences and ensure you're well prepared to fly on your own. Wing (paraglider) control in PPG is everything and has no direct similarities to anything you did in your past flying. It's powered paragliding and it has not much in common with flying fixed wings. You will need to spend time on the ground in order to learn and practice motoric skills required to "kite" (keep paraglider in the air) your wing. You must be current paragliding pilot with minimum P2 rating and minimum of 25h airtime solo hours. If you can kite your wing with your eyes closed, you're not afraid of thermals but you're just tired of parawaiting.... then this course is for you. Contrary to ULTRA, PPL or REC you have your risers and brakes figured out. However, since your license is not recognized by Transport Canada as sufficient to fly ULTRA aeroplanes in Canada we'll have to focus on getting your knowledge where it needs to be. We will also focus on differences between paragliding and powered paragliding (there's still quite a few). You will have to do CAT-4 medial, pass the ULTRA exam and apply for pilot permit. 1 We are 100% weather dependant. If the weather is not good we have to wait until it improves. This can take your course well beyond the number of days outlined. Operating out of Lucan Airport (CPS4). 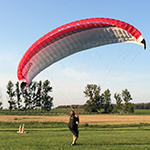 paragliding.ca is a division of 2422940 ONTARIO INC.